After watching writer/director Ti West’s previous films, like as “House of the Devil” and “The Innkeepers“, which are maddeningly nestled on the edge of the filmmakers brand of horror, I recall thinking how I’d like to see his slow-burn approach to the western genre. Granted, I was thinking of a mashup of both genres, like the ghost and mystery tales in the comics I used to read as a kid or the twisted macabre tales of Jeff Mariotte’s “Desperadoes“. West’s latest film, “In a Valley of Violence” does indeed take place in the west and while it’s not a horror western, it does combine somewhat expected brutal shocks with unexpected gallows humor for a moody memorable Old West homage of spaghetti westerns and a singular take on the classic revenge tale. On his way to Mexico, a figure on horseback makes his way across the southwest, accompanied by a dog. His name is Paul (Ethan Hawke) and we will come to learn that he is quiet and reasonable man, who is leaving a haunted past behind him that involves service in the military and his abandoned wife and child. He’s gotten to the point in life where he’d prefer to mind his own business and enjoy the companionship of his loyal and protective dog, Abby (played by the remarkable Jumpy), who’s got his back just as much as he has hers. So far, with the route Paul has taken, he’s managed to avoid contact with other humans, but he’s come to the point where he realizes that the quickest way to cross the border would be to make his way through a certain valley, through a desolate town called Denton. He could use a water refill and some food as well as a recharge. Unfortunately, Paul is confronted by Gilly Martin (James Ransom “Mr. Right”), a bored, hotheaded deputy itching to throw around his machismo at any stranger that comes his way. Gilly has no idea what he’s in for when he picks a fight with Paul and winds up quickly laid out in a bloody, yet justifiable altercation. Embarrassed in front of his fellow deputies, Gilly’s loud and obnoxious finance, Ellen (a hilarious Karen Gillan “Guardians of the Galaxy”), come to his aid, while Paul makes his way to a nearby hotel run by be her younger sister, the noble and sensible Mary Anne (Taissa Farming “American Horror Story”), who is delighted that Gilly was put in his place and develops quite a curiosity for Paul and Abby. In comes Marshall Clyde Martin (a game John Travolta), an honorable yet exasperated lawman, who understands a man like Paul more than he can tolerate his impetuous son, Gilly. The crippled Marshall advises Paul to leave Denton, knowing his son’s wounded ego will soon lead to some irreversible damage. Paul obliges and heads out, but is inevitably confronted once again by Gilly, who engages the loner and his dog in unforgivable violence that immediately sets off Paul’s dark side, unleashing an unforgettable hell on Denton. Now, I’m not going to get into any more details about the plot, but those who are animal lovers and viewers who’ve seen “John Wick” get the idea of the kind of violence that triggers Hawke’s Paul. Some may roll their eyes at the similarity between the two films (both made without an awareness of the other) but there’s nothing wrong with a solid concept executed well in different genres. Like “Wick”, West is more concerned with focusing his storytelling on pure purpose and characterization, trimming any fat in the screenplay to get right to the meat of the story. 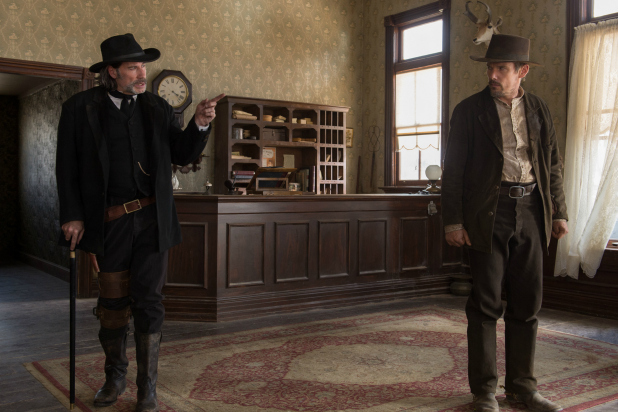 “In a Valley of Violence” becomes a more focused film once Paul embarks on his plan of revenge and West’s pacing is more methodical than what we typically expect from revenge flicks. West and his fellow collaborators are determined to bring a specialized, style to the western, while also tipping their hat to classics from Sergio Leone. Right when the lively animated title sequence kicks off film it becomes obvious West is fully invested in making this project come to life in a unique way. Shot in New Mexico for a couple months in the summer of 2014, by cinematographer Eric Robbins, who captures the beauty of the open terrain and guides viewers through the geography of Denton to provide an understanding of placement for the inevitable showdown at the end. Composer Jeff Grace, who’s worked on West’s previous films, pulls off a propelling score that fittingly evokes classic western soundtracks, while threaded a foreboding sense of tension that permeates throughout the film. 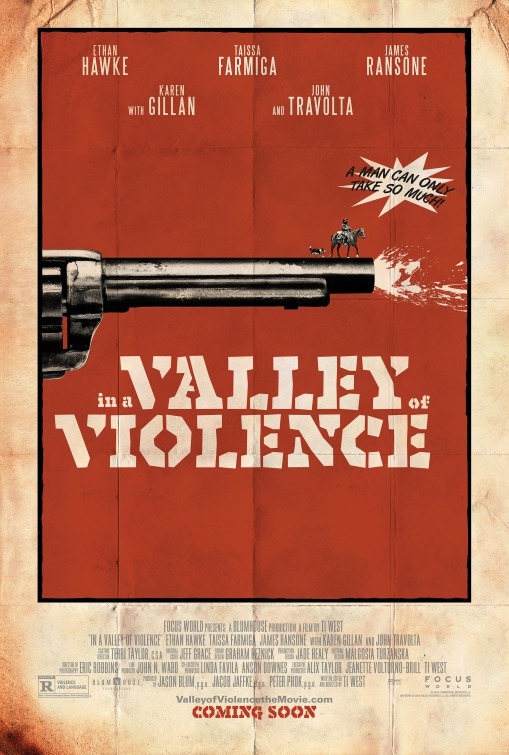 It may be surprising for a Ti West film, but “In a Valley of Violence” is nowhere near as dark as one might expect, knowing his previous work. Oh, it’s cruel and brutal, but it’s also easy-going and quite funny, thanks to the father-and-son duo that Travolta and Ransome play. Thankfully, West has written given Travolta, who usually plays a hammy, over-acting villain, a subdued multi-dimensioned character to chew on, leaving Ransome to successfully play to the rafters. They couldn’t be more different, but it is comical how they react to situations that are over their head. As the film’s lead, Hawke has an effortless handle on the reigns of his scarred character. It’s ironic that both this character and the gunslinger Hawke played in the recent remake of “The Magnificent Seven” suffer from post-traumatic syndrome disorder, but he plays them both so well. 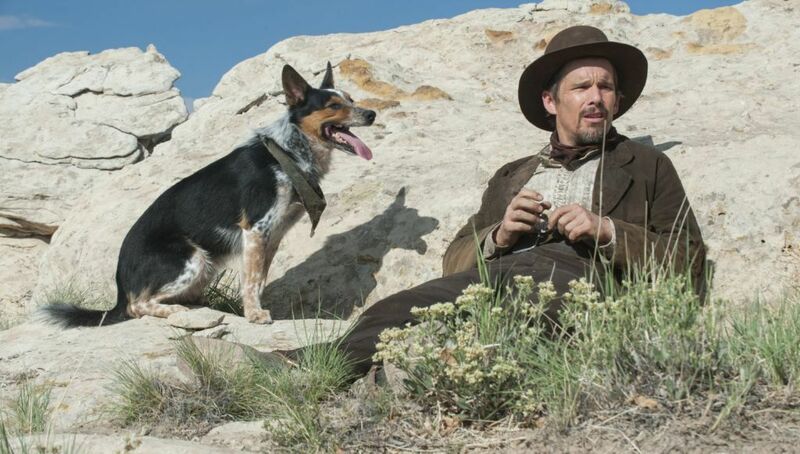 The performance that runs away with the film for me though was Jumpy, a talented border collie/blue heeler mix, who offers such an uncanny natural presence to the role. I know I know, it sounds so strange to wax poetic about a dog’s acting, but you’ll know what I mean when you see it. Whether of not this film sounds like your thing, you have to check out Jumpy here, either after you see the film or even if you don’t. That dog is awesome. Some may balk at the humor in “In a Valley of Violence”, but I appreciated how it subverts genre expectations and even surprises those familiar with West’s previous work. It’s a rare blast to see a filmmaker embrace a genre he respects and turns around and does something quite unique and satisfying with it.